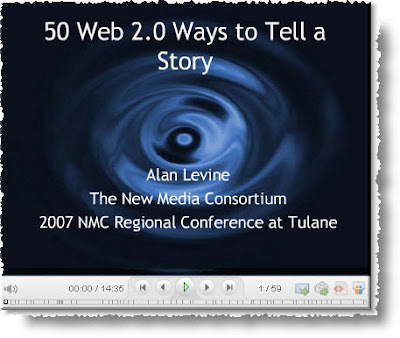 Actually, Alan Levine's presentation shows how the same story can be told 49 different ways, using 49 different free Web 2.0 tools (Amazingly useful anyway!)! If you are looking for free web 2.0 tools (to tell a story!) and reflections on using them, Alan Levine's presentation below, is simply a great starting point (Click on the graphic below. Yes!). 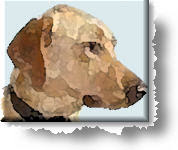 Design a basic story concept that can be created in a web 2.0 tool using images, audio, and/or video. Create it quickly using one of 50 different web tools that are free to use (Don't force one particular tool upon the participants, but instead let them choose from a bunch!). Share all the created stuff (by participants) using a wiki site with reflections on the value of the tools used. "The media files you use in your story have to be ones that are licensed or shared with permission to re-use; this is the only way you can safely then share your new creation knowing it does not contain any copyrighted material. So just finding a picture via Google is not satisfactory. For each media file you find, document the source by title and URL and find a person or organization to use to give credit." This link provides you links (URLs) to many excellent (free) media resource sites, if you are looking for multimedia, images, audio, and videos (e.g. Common Content, Pictures from Old Books, CC Hits, and Open Video Project). I can't imagine creating the same story using 49 different web 2.0 tools (I would go crazy!)! However, Alan Levine did it, and also made his adventure available to us in the shape of a SlideShare presentation (which perhaps reflects the power of this tool, too!). When a person goes to such lengths to explore the different free web 2.0 tools, we have to appreciate such great efforts, and of course spread the news, so that others can also learn from it. It would be interesting to know, how many free web 2.0 (or content development/learning) tools we can find on the web today? I would probably start figuring this out by exploring Jane Knight's growing directory of over 2,000 learning tools ranging from "traditional" course and content development tools through E-Learning 2.0 collaboration and sharing tools as well as tools for personal learning. Though, this directory combines freeware/open source and commercial tools, so we would need to do a bit of weeding and filtering to get some concrete numbers. Looking at the amazing evolution of free web 2.0 tools, we can expect in the future increasingly more new great (and rubbish!) easy-to-use tools to explore, use, share, reflect and enjoy. I suppose we have reached a stage when at least one new free web 2.0 tool is launched every day. Thanks to online advertising and networking, being free could eventually mean big bucks (YouTube, MySpace, Facebook, Skype, etc.). I have a question for the webmaster/admin here at zaidlearn.blogspot.com. Can I use some of the information from your post right above if I give a link back to this website?